If you looking for 2.1 speakers with great sound and within a budget price, then you are at the right place. In this post, we present you some of the Best 2.1 Speakers in India that are cheap and best enough for personal use. Music plays an important aspect in our day to day life. We often listen to music while working on our Computers. We have to admit the fact that our Smartphone speakers are not that great, and don’t offer quality sound with bass effect, so a 2.1 speaker is a must for all the music lovers. Listening to music while working increases our productivity and efficiency. There are different types of 2.1 speakers available in the market which creates confusion among buyers about which one to choose from. So, after some research, we have listed down some of the Best 2.1 speakers available in the Indian Market, that have a powerful sound, good base effect, is durable, and comes easily in your budget. The F&D A110 comes first in our list of Best 2.1 Speakers in India. It may look small in size but don’t judge it by its size. This small and handy 2.1 speaker system can deliver sound up to 3000 PMPO. 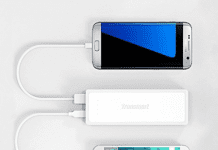 It has been designed in such a way that it consumes less power giving maximum output. This also has an inbuilt AVR (Automatic Voltage Regulator), so you don’t need to worry about the power fluctuations and damages it may cause to your speakers. The best part about these speakers is that it just weighs 3-kilograms, so you can easily carry it wherever you want. Easy to Connect with devices like TV, Mp3 players, Mobiles, and Laptops. 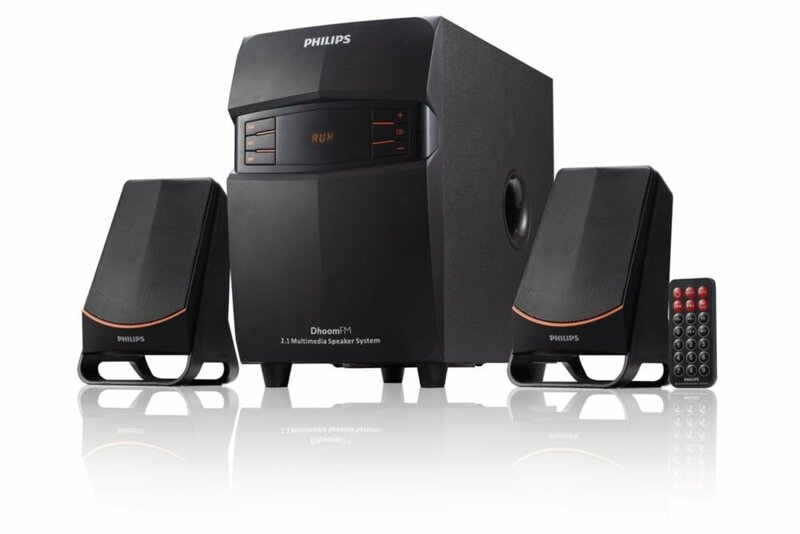 Creative SBS 2.1 A-102 comes second in our list of Best 2.1 Speakers in India giving a tough competition to F&D A110. 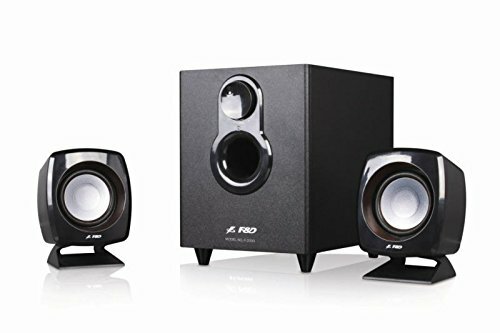 The Creative SBS A-102 has a subwoofer of power 4w rms while the output of each speaker is 2.5w. The best part about these speakers which makes it different from the rest of the list is its Wired Remote Control System. You don’t need to adjust the volume of Creative SBS by tuning the volume knob. You can do the same using a Wired Remote Control from a distance. The signal to Noise Ratio (SNR) of this speaker system is 75db so, you get crystal clear sound and it weighs around 2.5 kilograms. The F&D F-203G is the one which I have been personally using since past 9 months and I must say, this is the best deal which you can get under Rs 1500. The design may look traditional and outdated, but the sound quality is crystal clear with heavy bass effects. The F-203 G can offer massive audio 1500W P.M.P.O. It has 4-inch bass drives and 2.5-inch full range drivers for Satellites. It weighs about 2.1 kilograms and is portable and easy to use. Zebronics SW 2490 comes in very sporty and futuristic design. These speakers provide ample amount of crystal clear sound and give high bass effect. The best part about SW 2490 is that it has build in FM Radio Support which is absent in others on the list. You can tune in to your favorite FM stations and listen to old classics on your 2.1 multimedia speakers. The high glossy side panels give urban-cool look to the speakers making it perfect to be used anywhere. 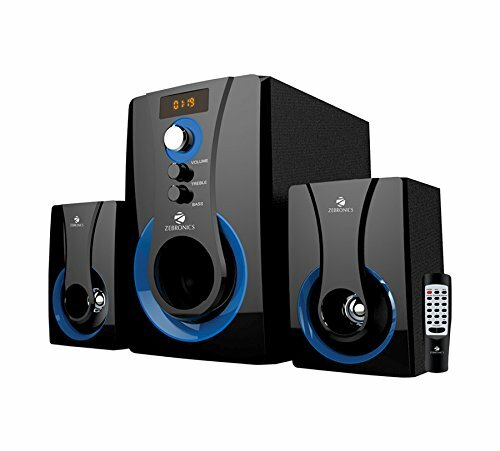 Apart from these, you also get a Remote Control to Wirelessly control your speakers from anywhere in the room. Supports SD card to play your favorite soundtracks. LED display to display soundtrack info. With Logitech Z333 Speakers, you can experience your music and movies like never before. It comes with a simple plug and play connection setup which you can easily connect to your Computer, Smartphones, DVD, Mp3 players, Gaming Consoles, and Televisions. The best part about Logitech Z333 is that you can connect 2 devices simultaneously using it RCA connector and 3.5 mm Audio Jack. In Z333 you also get a wired control pad which can be used to control the power, volume, and a headphone jack remotely. It can deliver up to 80-watts peak power and thus gives powerful clear, crisp and balanced acoustics. 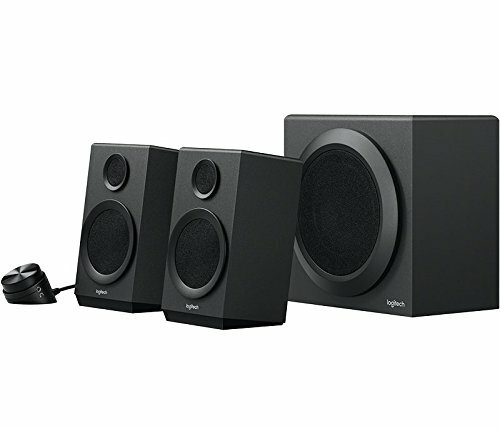 The Philips MMS- 2550F/94 multimedia speaker is designed for style and it looks like it sounds. It can deliver the sound of 2500W PMPO Output giving powerful and noise-free sound. The main highlight of this speaker is that you can connect your USB Pendrives and SD cards to play music directly from your Flash Drive. However, the limitations with this are that it only supports Pen Drives up to 8Gb Storage Space. Also, the Pen Drive should have only mp3 files to be able to play with these speakers. 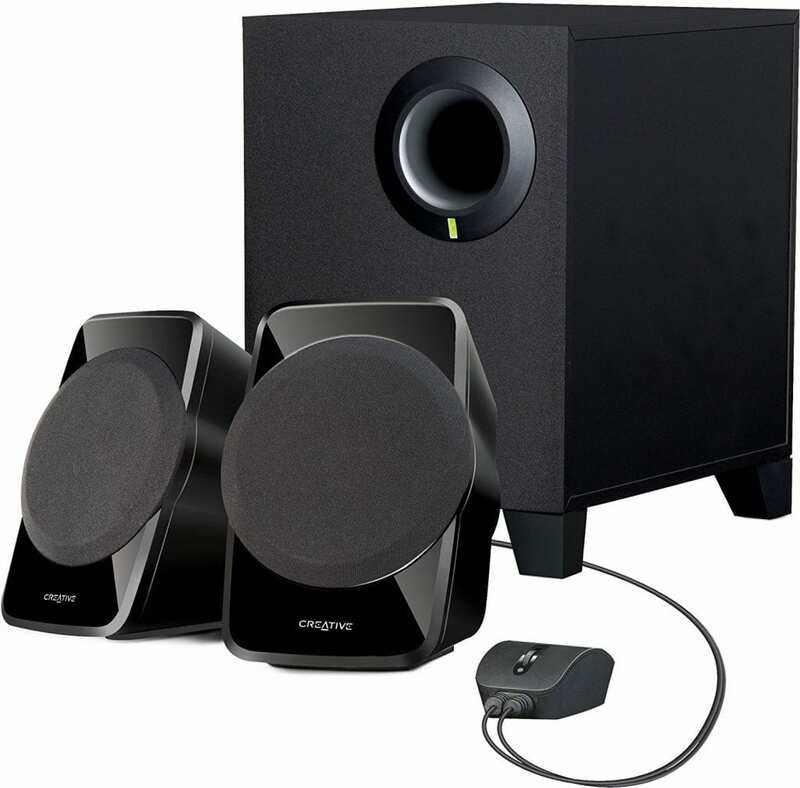 The subwoofer provides a good thumping bass effect which can provide theatre like experience at your office/home. Creative E2400 will surely take your Music Experience to another level. 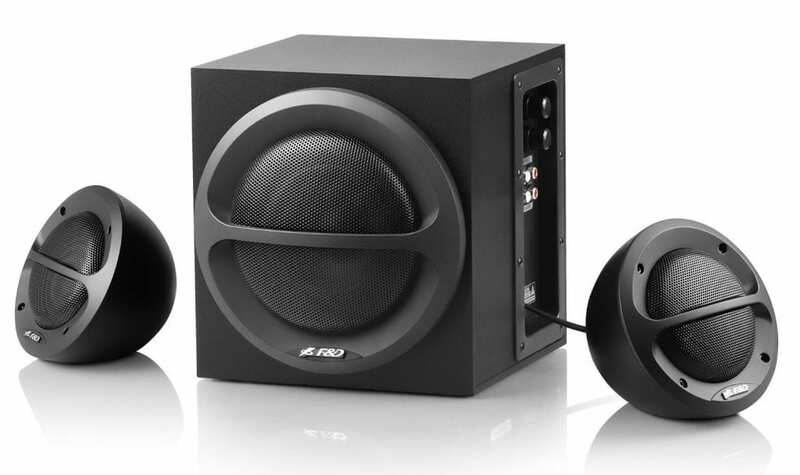 The E2400 can comes with wooden subwoofer cabinet for extra bass effect and can deliver up to 25 W of raw audio power. 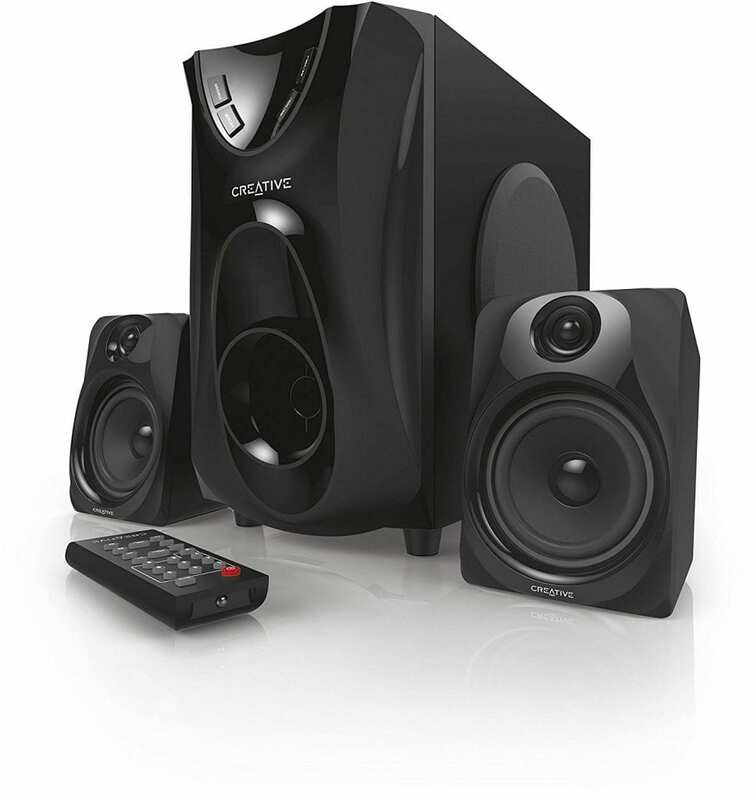 It is a multipurpose Home Theatre system as it can be connected to almost every audio device. For connectivity, it comes with RCA cable and 3.5 mm audio jack with inbuilt FM Radio System. You can easily customize this Home Theatre System by using its multiple equalizers presets depending upon your mood and music. You also get a wireless remote control to change the music tracks and audio volume remotely. So, this was our list of some of the Best 2.1 Speakers in India that can easily fulfill your needs without making a hole in your pocket. All these speakers have their own pros and cons, so you need to decide yourself which one to look for. Comment down below if you have any doubts regarding any of the speakers mentioned above. Our Team would get back to you as soon as possible.